Wetted Materials: 316 L Stainless Steel. Temperature Limits: Plastic flags: 300 °F (149 °C); Aluminum flags: 400 °F (204 °C). Dimensions: Tube diameter: 2-1/2 inches (64 mm). Customize level indicators to meet application requirements. Visi-rite level indicators are low maintenance, environmentally friendly, durable, and require no external power. Specify any indication length up to 96 inches (244 cm). 1) Select connection configuration and mounting type from the chart below. 2) Specify total indication length, L1. 3) Specify application information including media type, specific gravity, operating pressure, and operating temperature. 4) Specify flag material as plastic (orange and white flags) or aluminum (silver and black flags). 5) Specify output if required. 6) Specify vent or no drain (mounting options 13 through 24 only). 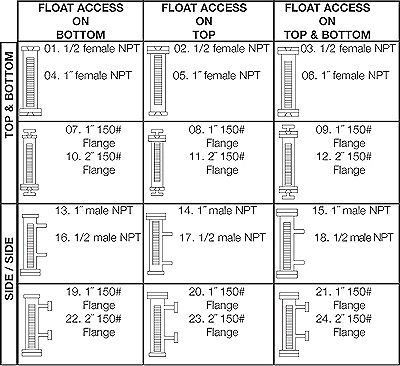 A 1/2" female NPT drain is supplied standard on options 13 through 24. *Options only apply to connection types 13 through 24 only.